Omega-3 + CoQ10 + D3 Gold provides a broad spectrum of health benefits in one convenient softgel. 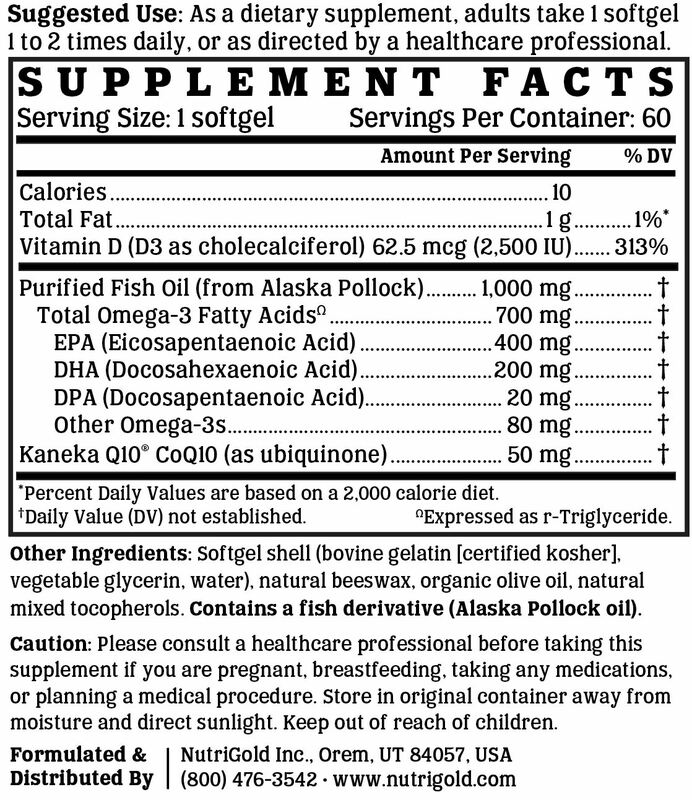 Each softgel delivers 600 mg of EPA + DHA in triglyceride form, 50 mg of the clinically proven Kaneka CoQ10, and 2,500 IU of bioavailable vitamin D3 (as cholecalciferol). This synergistic formulation helps support healthy heart, cognitive, joint, and immune functions. Omega-3 + CoQ10 + D3 Gold is manufactured in the USA to industry-defining quality standards and is verified by independent third-party labs to meet purity and potency label claims. Omega-3 fatty acids, also known as polyunsaturated fatty acids, are essential to many of the body's functions, but cannot be synthesized by the body. Instead, to get the required amounts, they must be taken in from food or supplementation. Omega-3 fatty acids play an important role in supporting cardiovascular and joint health, are important for brain function, and are crucial for normal growth and development. CoQ10 is a powerful, fat-soluble, vitamin-like substance that is biosynthesized in the membranes of cells and is vital to the production of energy. As an antioxidant, CoQ10 offers protection from oxidative damage and helps support healthy heart, brain, and joints. Vitamin D is an essential nutrient that helps build and maintain strong bones and teeth and supports breast, prostate, and immune health. Vitamin D is available in very few foods, so most vitamin D must be obtained through sun exposure or supplementation. We like to make supplements that can be enjoyed by everyone. That's why our products are always compliant with the best practices for avoiding allergens and minimizing cross-contamination. Omega-3 + CoQ10 + D3 Gold is free of soy, gluten, egg, milk, peanut, shellfish, and corn allergens. Consistent with our guiding principle to “do no harm,” Omega-3 + CoQ10 + D3 Gold is manufactured without the use of additives or preservatives. It contains absolutely NO contaminants, pesticides, herbicides, harmful additives, residual solvents, magnesium stearate, or hexanes. Like all NutriGold products, Omega-3 + CoQ10 + D3 Gold is subject to over 140 purity and potency assays by independent, third-party labs to ensure that the product meets or exceeds its claims. So, you can be certain that what's on the label is what's in the bottle. Nothing more, nothing less.